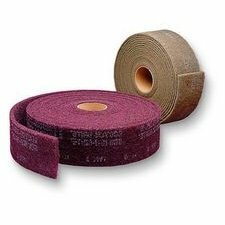 3m Abrasive 048011-00302 ''Scotch-brite'' Clean and Finish Roll a Crs - 4''x30ft by 3M at In The National Interest. MPN: 61500121597. Hurry! Limited time offer. Offer valid only while supplies last. ''SCOTCH-BRITE'' CLEAN AND FINISH ROLL 4'' X 30 ft. Flexible web for finishing, blending, and polishing. Conformable for access to hard-to-reach. "SCOTCH-BRITE" CLEAN AND FINISH ROLL 4" X 30 ft. Flexible web for finishing, blending, and polishing. Conformable for access to hard-to-reach. Great for general use on a variety of materials. Use manually or on an in-line sander. Abrasive mineral: Coarse grade aluminum oxide. Color: Maroon. Flexible web for finishing, blending, and polishing. Conformable for access to hard-to-reach. Great for general use on a variety of materials.